Right now my life seems like it’s all over the place. From scrambling to plan a back-up honeymoon, to organizing our apartment and unpacking wedding gifts, I feel a little discombobulated. I suppose my workout this morning mirrored my life! After a super-quick walk with Sadie in the drizzly rain, I headed home to take a quick shower before heading to work and stuffing my face with a bowl of pumpkin oats. 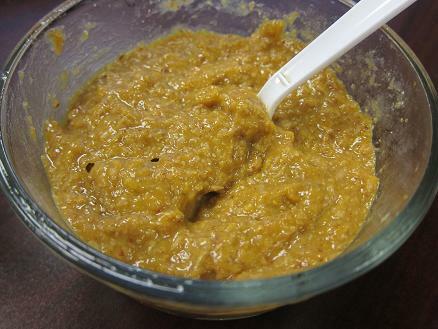 Since I had a can of pumpkin open from last night’s pumpkin cheesecake mousse creation, I decided to use several scoops of the nutritious orange stuff in a big bowl of oatmeal. 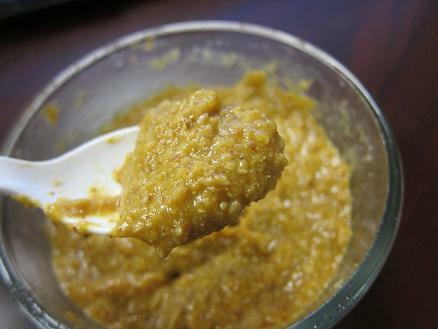 After sweetening the mix with a spoonful of honey, my oats were ready for eatin’. I love the texture, volume and flavor pumpkin adds to a bowl of oatmeal. Plus, it’s seasonally appropriate which makes me oh-so-excited for Thanksgiving. Speaking of Thanksgiving, my local grocery store has already created displays featuring holiday foods including pumpkin, cranberry sauce, marshmallows, sweet potatoes, the ingredients for green bean casserole, stuffing and more. I’m a stuffing gal too! We felt so crazed right after our wedding this summer so I can only imagine how you are feeling with the honeymoon madness. It will work out beautifully. 🙂 This is such a special time…even though crazy, you won’t get these days again!!! Fav dish? Stuffing, hands down stuffing. My mom makes a homemade stuffing out of classic white bread sauteed in lots of onion, butter and then turkey. It is SO INCREDIBLE. i love sweet potatoes w/ a crumbly top – almost like a streusel. so, so good! I second the pumpkin cheesecake. I make mine with a gingersnap crust. It’s so good. I also make a mean cornbread stuffing with lots of rosemary and thyme and caramelized onions. gingersnap crust!?!?! you may be a genius. Mine is for sure the stuffing! BUT I love green bean casserole with cream of celery soup (sounds gross, but is healthier than the cream of mushroom AND tastes the same!). It is also a Thanksgiving necessity for me to mix the canned cranberries with the turkey as I eat 🙂 yumm-ooo! 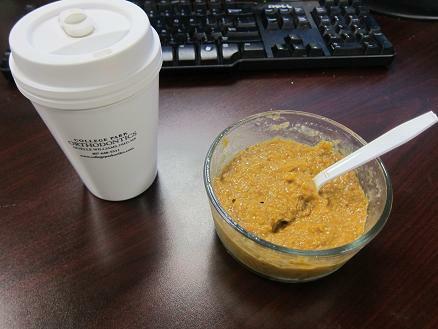 AND guess what – I tried the cottage cheese/pumpkin bowl this morning for breakfast! To add a little cruchola, I added a few tablespoons of Honey Bunches of Oats. Deeelish! i once ate an entire box of honey bunches of oats in one day. true story. which is why i need to limit myself to using it as clever toppings. 😉 i’m a cereal demon! love the green bean casserole for some reason!!! it is sooooo additcing. the crunchy onions on top are the best part! Good luck with planning your honeymoon. I’m sure everything will work out for the best and you will have an amazing time! Things will settle down soon, girle. Try and enjoy the…spontenaeity? for now 🙂 Breakfast looks yum! OMG. you help me put things into perspective. clearly we’ve both been through a lot with our wedding hiccups, but i give you all the credit in the world. i hope you are able to get his ring back! i’m taking this comment as a reminder to get our rings insured ASAP! Ahhh! I do the exact same thing. I put everything on my plate and then mix it all together. I just think they all go perfect together. Even the cranberry sauce and gravy. Something weird. I HAVE to have peas on thanksgiving on my plate. It just isnt the same when they’re missing. It’s odd because Im not a gigantiv pea lover, but its just something about it all. i’m totally the same way. one year my mom forgot to make peas & my dad and i were so sad. she quickly ran to the freezer and steamed some up b/c we needed them to stir into our mashed potatoes! My mom did the same exact thing one year! I’ve never celebrated thanksgiving but I loooove pumpkin pie :). Yay! I knew I wasn’t the only one who does that! Corn mixed in mashed potatoes is so good! I love green bean casserole and mashed potatoes! What…. No mention of bisquits & gravy on turkey day? My all time favorite (only once a year though). My favorite part is turkey, mashed potatoes/sweet potatoes (my mama makes a great mix! ), grrravy 🙂 and of course pumpkin pie! mmm DEFINITELY the stuffing. The turkey is actually the most bland part of the meal, I think!! I’m a green bean casserole girl from way back. But after first trying cranberry relish and jelly last year, I might be switching. I love Thanksgiving food! Top would be Cornbread dressing, then green bean casserole and sweet potato casserole. I’m kinda hosting this year and pretty nervous! My favorite part of the Thanksgiving meal is tasting all the pies! I love green bean casserole and mashed potatoes!! Yum! However this year I think I’m going to try making mashed SWEET potatoes! Oh, I love thanksgiving! Favorite Thanksgiving dish is warm pumpkin pie with Blue Bell vanilla ice cream on top. LOVE stuffing! and…pumpkin pie : ) It’s my favorite dessert! I love pumpkin pie. Love love love. Thanksgiving dishes have nothing on CHRISTMAS dishes though. Thanksgiving for us is like a slightly smaller version of Christmas dinner. I love the feeling of GORGING myself once a year over a christmas dinner! Haha. I love sweet potatoes with marshmallows and pecans on top! I have a hard time choosing just one Thanksgiving dish. I love the stuffing, the sweet potatoes, and the green bean casserole! I don’t think I can pick just one! I love stuffing, potatoes, gravy…oh and pumpkin pie is my favorite!! I love thanksgiving! Just yesterday I went to Cosi and got their thanksgiving turkey sandwich. It was the perfect combination of thanksgiving fixins! I wrote about it on my site. If you have a Cosi nearby you need to try it! I always loved the rolls, super soft, chewy and soo good. I’m so bummed that I have to be gluten-free now. It’s definitely not going to be the same this year! Stuffing, cranberry sauce from a can, mashed potatoes, and gravy! Everything? I love all the side dishes. OH and pie. Can’t wait for the holiday! I agree stuffing is absolutely the most delicious part of thanksgiving! I like trying different recipes each year and have never found one I didn’t like! Mine are the sweet potatoes topped with marshmallows. Really, that should count as a dessert. My mom’s pumpkin pie! It has melted marshmallow in the filling. RIDICULOUS! My grandmother’s cranberry mold…I once flipped my lid when she mentioned that she wasn’t going to make it one Thanksgiving…no such threats have been made again and I anticipate having the canberry mold this Thanksgiving. I think she kinda liked how upset I was that she considered not making it.